I have only just written up the March and April Diaries and I am putting up the April one first because it’s about the current exhibition, and in time for you to visit – In the Age of Giorgione Royal Academy – until 5th of June: Includes painters who were contemporaries and influenced by him. 16th Venetian painting is painting at its height. It signalled the Renaissance with its humanism and discovery of the Greek mind. Giorgione is not better than Bellini; nobody is. When you say, Bellini, you have to say, colour: unsurpassed! There is no progress in art. Though engaged with each other the people in this painting keep their distance from the viewer; the painting is an icon to be worshipped. His portraits also keep their distance. Giorgione includes the viewer. This is the difference between the old formula and the new. Now we get involved in the emotions; each painting is a vision, a story, a world, a life. 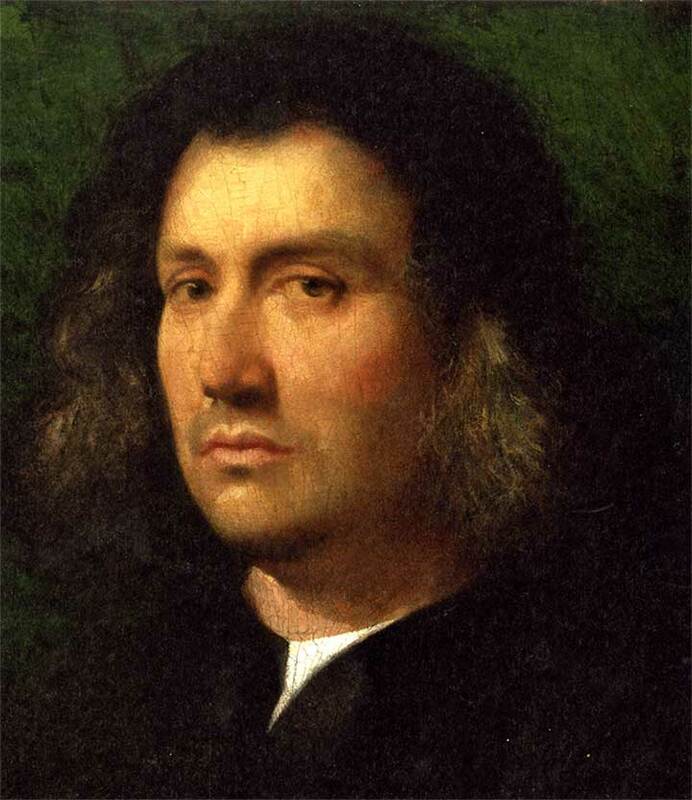 In this portrait Giorgione was able to capture his direct relationship with the sitter. Giorgione, 1478-1510 died from the plague, aged around 33. He is a legend. We know little about him and over the years critics have debated which paintings can be firmly attributed to him – very few. He intrigues because his work has an internal mystery; he paints what he sees, what only he can call forth. Portraits by Albrecht Durer 1471 – 1528 are included in the exhibition. He also attracts the viewer to the living emotional character of the subjects of this paintings. He was working in Venice at the time and Giorgione admired him. I don’t know why these two remarkable portraits by Durer have such brown skin, they have a history of overpainting and cleaning, perhaps that’s why. Durer walked to Venice from Nuremberg – people did in those days, stopping at inns along the way. 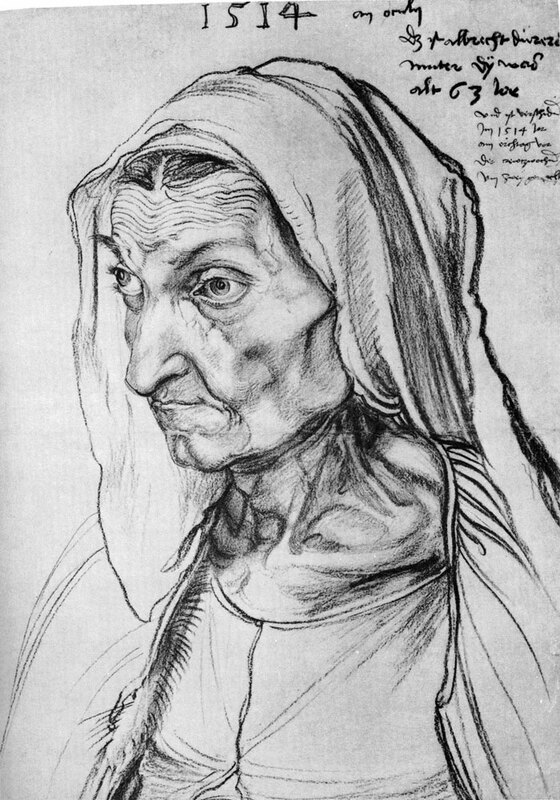 I find it awesome that Durer’s mother had 14 babies/children and that he (genius) was the only one who survived. Portrait of the Artist’s Mother at the Age of 63. 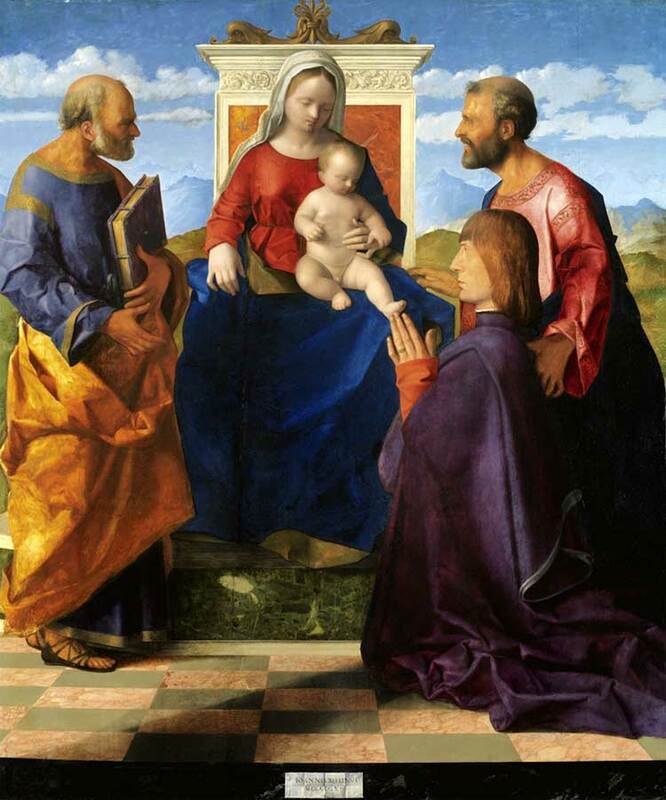 Giorgione was a master by age 20 and famous in Venice. (Though age expectancy was precarious, children in this time benefitted from intense early training and education – think of Christopher Marlow and Shakespeare, both born in 1564). Titian who trained with Bellini was 20 (10 years younger than Giorgione) when he worked with Giorgione on the frescoes of the façade of the Fondaco del Tedeschi. 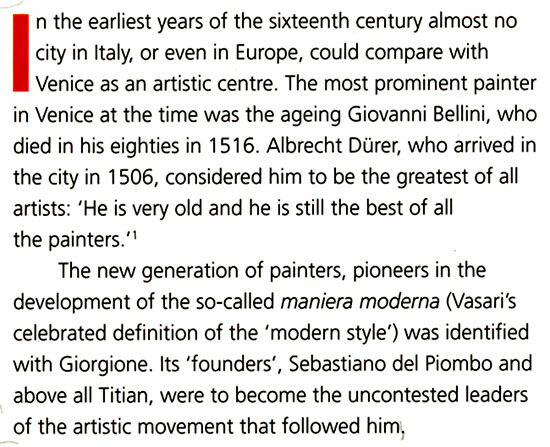 Titian copied his method, lived to be old and (Andreas tells me) went on to invent ¾ of all the original ideas of painting. This painting tells a story from the Bible in one go: a woman “taken in adultery” is being dragged off to be stoned. Jesus says, “Let him who is without sin cast the first stone.” Nobody does. A Hollywood film could not tell the story so well. Art galleries are free in London. For special exhibitions you have to pay (£10 for this one? – CHECK). If you can’t afford it, think; maybe you save £10 if you go out with your friends for a drink, why don’t two of you do this instead? – Or all of you. Then have a picnic in the park. Or go to the National Gallery. 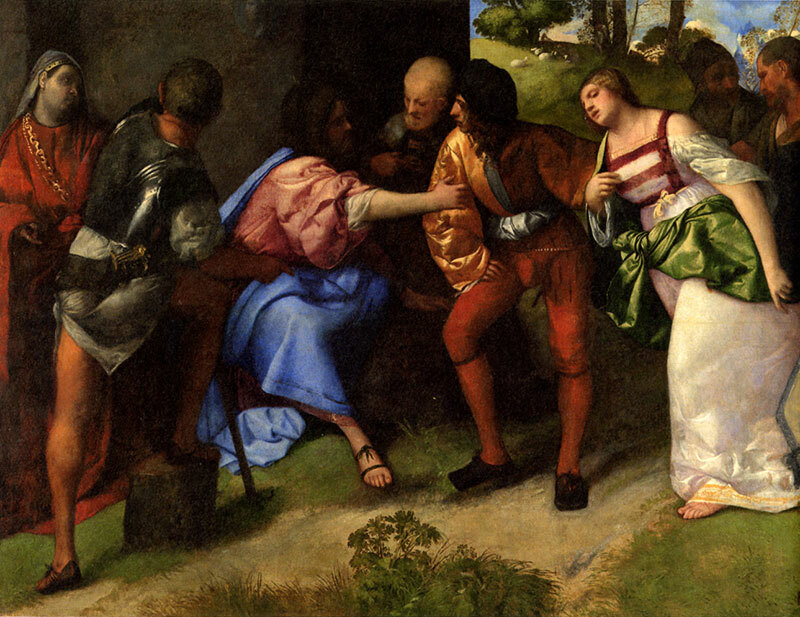 Giorgione is there and look at Titian and Bellini. In any case or if you live far away look at art books, then one day visit the real thing. Keep in touch with Climate Revolution website, especially the Diary. It will give you ideas what to do. What we’re talking about is self-education, which is the best education. Then you’ll have something worth talking to people about – do it with friends anyway. And read – books. You’ll start connecting things. To know the past is to know the present and the future, engage with the world, reclaim the culture. Climate Revolution and others are forming the movement, Intellectuals Unite starting in the schools and universities clubs. We are in discussion about strategy to overwhelm the government and to stop their havoc and destruction. You can join by doing two things: self-education and demonstrate. (ie. Join the demonstrations people are organizing – there are now more than ever). Watch Climate Revolution for more information – send us an e-mail (climaterevolution@viviennewestwood.com) to join. Later as we build Intellectuals Unite it will have its own site. Indeed the only way we will achieve victory for Intellectuals Unite in saving the world depends on sustaining the movement. You will do that by continuing to self-educate. This is your roots and you will always be there when we need you. Climate Revolution has begun to help the campaign to Save Venice. I wonder if it should be a focus for you in Intellectuals Unite. Venice is the canary in the mine; if you can save Venice, you can save the world. – First we have to stop the cruise ships churning up the lagoon. I will put up the March Diary next week. I have tried to subscibe for the newsletter but the messge always fails. Could you please add me to the newsletter subsciption. I strongly support and reccomend to others your work and effort but humanism is THE source of neo-liberal thought and climate change is one of its end results.